This course provides an in-depth understanding of how and when to use multi-vari as a pre-experimentation and analytical tool to eliminate the major causes of variation in a process. It covers basic statistics tailored to understanding the more advanced analysis of multi-vari data. Emphasis is placed on statistical analysis (ANOVA) of multi-vari data in order to identify, quantify and reduce sources of process variation and improve the process. 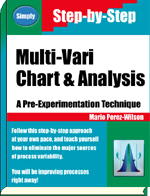 The course teaches the participants how to select the process variables to include in Multi-Vari, how to select a sampling scheme, how to implement it in production (chart), and more important, how to identify and quantify the major families of variation (positional, cyclical and temporal) in a process.